In order to understand the question of how social and partial social notions of landscape are perpetuated, it makes sense to examine the different forms of socialization of landscape. Landscape socialization research is able to contribute to the understanding of why and in what way certain interpretations of landscape are similar (especially with regard to stereotypical patterns of interpretation and evaluation) or different (especially with regard to native regular landscapes, but also with regard to the differentiation of expert, technically bound special knowledge). It becomes clear how closely this interconnects with other thematic fields of landscape research, such as the question of social power structures, landscape aesthetics, and also the examination of landscape paradigms as well as the investigation of the historical development of landscape concepts (specifically in cultural differentiation). Theoretically, landscape socialization research can be connected in a special way to the constructivist family of theories (especially to social constructivism and discourse theory). 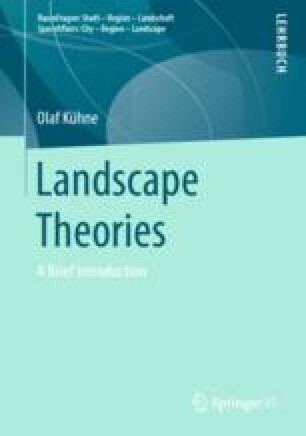 From this perspective, research questions arise as to how, for example, technical paradigms from the expert special knowledge stocks affect systematic components of the emergence of stereotypical landscapes (‘landscape education’), how individual contradictions between native-normal landscape ideas and stereotypical and special knowledge stock ideas are interpreted. If the cultural ties and also the social differentiation of landscape interpretations and valuations are taken serious scientifically, the focus of research is increasingly on the specific and special. This can also be applied to the investigation of scientific research traditions, as it is here in the comparison of Anglo-Saxon and German-language geographical landscape research. It becomes clear that Anglo-Saxon geographic landscape research was carried out much more continuously, whereas in the German-speaking world it was restricted for a long time to physical geography due to the Kiel Geographer’s Day (in German: Kieler Geographentag; today renamed in: German Congress for Geography, in German: Deutsche Kongress für Geographie; it is the largest German-speaking congress for geography and its subdisciplines) and came to a virtual standstill in human geography for more than three decades.